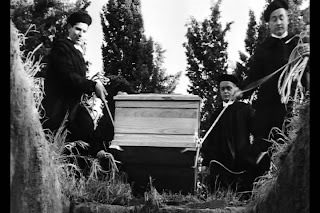 Most sources cite Mario Bava’s “The Girl Who Knew Too Much” (1963) as the first giallo ever made. 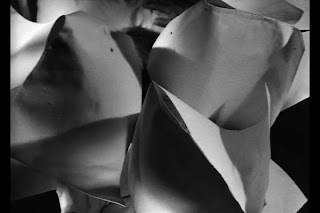 Within one minute of the opening credits (with its highly atypical Adriano Celentano samba score), viewers can identify the primary influence: Hitchcock. We see a young woman named Nora (Leticia Roman) meeting an attractive stranger on a plane and accepting a box of cigarettes from him. When she arrives at her destination airport, a group of officers arrest the man as a drug dealer, revealing that his suitcase is full of marijuana laced cigarettes. Nora panics, realizing that she has already smoked one and has an illicit boxful in her pocket. She tries to drop it on the ground, only to have someone pick it up and hand it to her as she tries to walk away. This whole sequence ends up having almost nothing to do with the main plot, but it communicates the Hitchockian feel. Nora even has a passing resemblance to Grace Kelly, the dark-haired man could easily be one of Hitchcock’s handsome protagonist/villains and the black and white photography takes cues from Hitchcock’s oeuvre. The intro specifically reminded me of “Strangers on a Train” (1951) although the main plot is explicitly a reference to “The Man Who Knew Too Much” (1934/1956). Nora, an American, arrives in Rome to visit her sick aunt. Dr. Bassi (John Saxton) is taking care of her, and quickly becomes a romantic interest. Her first night in town there is a terrible storm. The lights go out and Nora hears her aunt crying out for her. She swiftly enters the room and tries to prepare some medicine, but is, alas, too late. 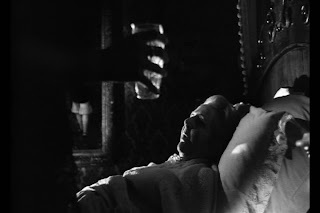 The death is given the ultimate dramatic treatment: lighting flashes, a cat hisses, Nora screams and drops the glass of medicine to shatter against the floor. She turns and flees into the rain. Still, none of this has anything to do with the main plot. 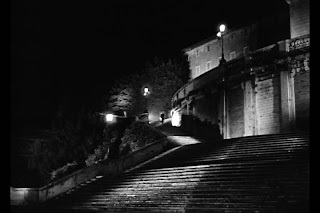 Nora is immediately mugged on the enormous staircase of one of Italy’s great cathedrals and she passes out. As if to top off the worst day ever, she witnesses a murder as soon as she comes to. Across the landing from where she hides she sees a young woman die of a knife wound and a strange figure remove the blade. She passes out again and appears to be mugged by another man on the next morning before a police officer finds her and wakes her. There is, of course, no trace of the murder she witnessed. Nora is taken immediately to a hospital. 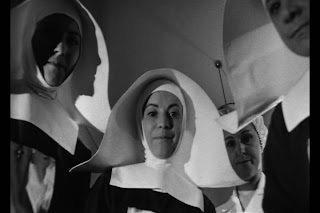 The scene begins with a very Bava-esque transition featuring nuns (initially such that the image looks like abstract art) that draw back like a curtain to reveal Nora lying in a bed (see screenshots below). 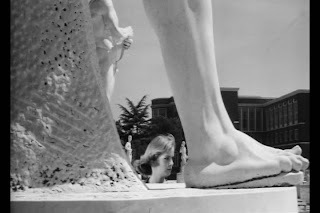 A comically overdramatic sequence follows in which hard cuts abbreviate time: shots alternate between Nora and unbelieving visitors over a sizable period of time as though she experiences them as a single conversation. It culminates with a doctor lecturing his students on how Nora is a textbook case of hysterical delusions (ouch). Dr. Bassi shows up late to the lecture and rescues Nora when he recognizes her. Coincidences begin to mount as our lead is taken in by a friend of her aunt, Laura Craven-Torrani, who happens to live at the closest house to the site of the crime. While staying there, Laura discovers that the crime she witnessed was an exact duplicate of three murders that took place at the same local, ten years earlier. These were known as the alphabet murders since the victims has last names beginning with A, B and C. Unfortunately, Nora’s last name begins with D. Laura also happens to have a husband who is mysteriously always absent and the husband has a locked room whose door gets more close-ups than any cast member save Nora herself. For all the attention the door gets, and especially its infernal handle, it never actually opens from the other side. Bava faked me out about nine times by making me feel as if all hell was about to burst loose from behind the wooden paneling and then cutting elsewhere. When we finally get behind the door there is a surprising twist, but I can’t help feel that this movie is more about the tension than the revelation. Symptomatic of this focus is the enormous amount of fake outs and red herrings the audience is subjected to. Every time we think something suspicious is occurring or that the murderer is about to strike, it turns out to be a misunderstanding. This happens in excess of a dozen times, and when we learn who the killer really is, it turns out to have nothing to do with any clue or any scare in the film up to that point. It also stretches believability pretty far and introduces many questions that never receive answers. We end up with that impossible brand of killer who has no motive except insanity although the craziness doesn’t manifest itself in front of the audience until the final confrontation and doesn’t interfere with their flawless criminal plots. Some of the scenes of tension are actually quite good. In one memorable case, Nora walks down a hotel corridor towards a threatening voice that beckons her onward. The windows are open and wind sways the hanging light bulbs along the hallway in an eerie fashion. She peers into the dark room at the end of the hallway, straining to make out a figure. I won’t spoil the truth. 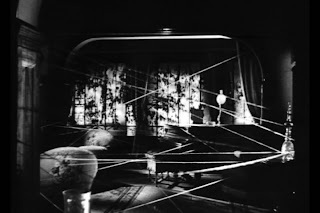 An even more creative scene has Nora covering the floor with talcum powder and stringing twine between the walls and furniture to make any intruder into her house slip into her tangled web. The narration informs us that Nora reads too many mystery novels. I’m inclined to agree, but it’s a great scene anyway. The mere presence of a narration, as usual, tends to be a mistake. It is far too expository and redundant, appearing jarringly at about five occasions and otherwise fading from our attention. Strangely, the voice sounds like an adult reading a book to a child and it removes any atmosphere or tension. Another mistake that seems to drain the power of the fake outs is that the identity of the killer appears to be spoiled within minutes of the crime (for the audience). Although looks can be deceiving, it still eliminates a large number of the scant suspects. Perhaps the best aspect of “The Girl Who Knew Too Much” is the crisp, well-restored photography. 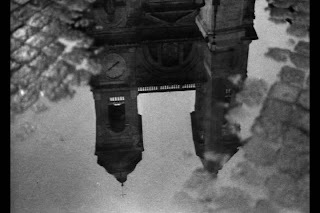 Already at this early stage, Bava is experimenting with unusual camera placement and making use of historical landmarks (another Hitchcock influence). 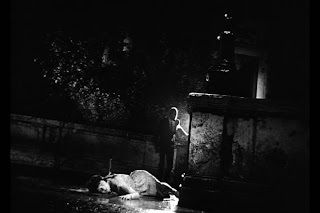 The lighting is reminiscent of “The Third Man” (1949) with dense patches of darkness and lots of silhouetting. 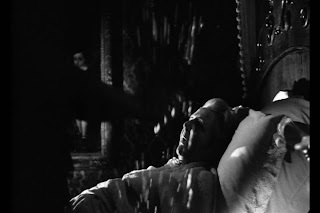 The use of staircases for the natural texture of black and white horizontal streaks is striking and the high contrast in everything from Nora’s eye makeup to the aunt’s shrouded bedroom is visually arresting. 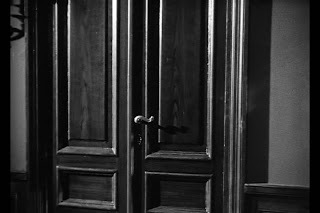 As a giallo, “The Girl Who Knew Too Much” is more a historical transition point than an archetypical example. The body count remains low, the killer lacks the usual black gloves and trenchcoat and the B/W coloration is obviously restrained. 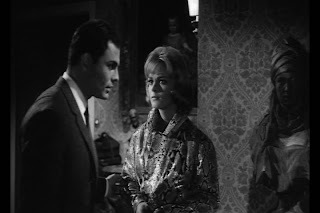 Bava would take a big step forward soon after with “Blood and Black Lace” (1964), bringing color (particularly his trademark tinted lights), more kills and less class. “The Girl Who Knew Too Much” will appeal more to Hitchcock fans and fans of psychological horror than to the typical giallo crowd.